Ana Marie Cox interviewed Alice Wong and then myself about disability and language and being uncomfortable. Alice’s interview is great! Alice: I consider myself a cousin of Darth Vader. Ana: It’s ok to say crip? Celebrities are good for fund raising. Autism Society is backing “Aut Fest,” an autism-related film festival. The good news: The latest anti-vax film isn’t on the schedule that I can see. The bad news: Autism Society is banking on Ben Affleck bringing in the big bucks. Affleck played The Accountant, an autistic hitman whose character depended heavily on multiple layers of damaging stereotypes about autistic people. The Accountant most assuredly is an honest depiction of autism — but it is an honest depiction of what autism looks like through the eyes of humans who are allistic . . . that is, not autistic themselves. As such, it is a painful and often stereotypical rendering of a character who is constantly and explicitly signified as Other. For the duration of the film’s 128-minute runtime, we are treated to the cold spectacle of a man whose human qualities are confined to a minimum. His face is uniformly mask-like; he exhibits no sign of a life outside the confines of his work (and of the plot); he doesn’t even bleed when punched in the face. A number of motifs do the unsubtle work of reminding the audience that Chris is not one of us. I’ve been thinking a lot about Speechless. It’s not perfect. No work of cultural creation is perfect, especially when engaging in complex intersections of identity and agency. But it starts and ends with trying to make sure disabled people finally take control of their own narratives, in so many ways. As I wrote for Pacific Standard, I think the tightness of the genre (family sitcom) helps. Similarly for Switched at Birth or Spring Break Zombie Massacre. I’m sure there’s an autistic-hitman movie that could similarly exploit the tightness of the genre to tell new stories about disability. The Accountant isn’t that movie. Ben Affleck as headliner is a sign of going for the bucks, going for things that make donors and parents happy, at the expense of the autistic community. Let me know if other autistic writers comment. Then there are the legal and policy questions. Why is Qdoba not accessible to disabled patrons in the first place? No one should have to wait outside a door to be let in. And shouldn’t Kentucky provide appropriate community-based supports for this individual so a disabled woman can lead a more independent life rather than rely on the kindness of strangers? Here I think the answers aren’t that complicated. T. here seems to be a relationship between this husband and wife and the server in question. That’s lovely. Ask for consent before posting. Me: did you ask their permission before taking the photo? I did not, I honestly didn’t even think about it. 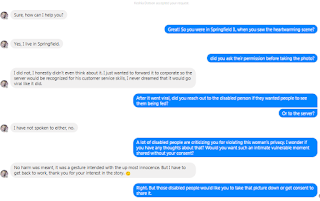 I just wanted to forward it to corporate so the server would be recognized for his customer service skills, I never dreamed that it would go viral like it did. After it went viral, did you reach out to the disabled person if they wanted people to see them being fed? Or to the server? I have not spoken to either, no. A lot of disabled people are criticizing you for violating this woman’s privacy. I wonder if you have any thoughts about that? Would you want such an intimate vulnerable moment shared without your consent? No harm was meant, it was a gesture intended with the up most innocence. But I have to get back to work, thank you for your interest in the story. Right. But those disabled people would like you to take that picture down or get consent to share it. The picture is still up. 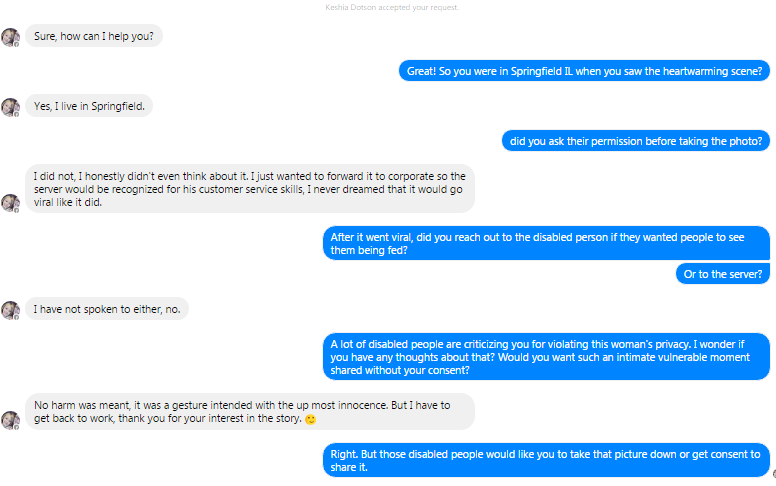 Once again: Do not take pictures of disabled people without consent. Do not share pictures you shouldn’t have taken on social media without consent. Anthony Corona died after being placed with his head between his legs for twelve minutes. In the aftermath, the coronor at least partially blamed autism for his death. Following a physical confrontation with another student and after school employees’ attempts to restrain Corona failed, the bus driver pushed the teen’s shoulders down, forcing his head between his legs, for 12 minutes until he stopped breathing, a San Bernardino police report stated. He died in the hospital a short time later, officials said. Authorities concluded the death was a homicide, which means “death at the hands of another, but not necessarily implying intent or culpability,” states a coroner’s report provided by the family’s attorney Dale Nowicki. His death resulted from “positional asphyxia,” meaning he was put in a position where he couldn’t breathe for several minutes, according to the San Bernardino County Sheriff’s Department Coroner Division and San Bernardino police Lt. Mike Madden. Corona’s autism and mental retardation contributed to his death, a coroner’s report states. I’m looking for the actual report, but this trend of blaming a diagnosis, rather than the violence visited on the disabled body, is both pernicious and pervasive. This kind of restraint is lethal far too often to far too many people, and in the aftermath, medical and law enforcement authorities fixate on the disability rather than the action (even should the action be justified). See both Ethan Saylor and Eric Garner for widely publicized examples. Post Traumatic Stress Disorder (PTSD) needs to be understood as disability for many reasons. First, it’s a disability, requiring numerous varieties of interventions and accommodations. Second, it’s incredibly common, so when we understand it as disability, it challenges our notion of normal, whole, or abled. These are lines we need to blur. From Chicago Tribune, here’s a new study on trauma and black women in Chicago. A recent Northwestern Medicine study that examined the South Side neighborhood of Oakland found that 29 percent of the 72 African-American study participants have the disorder and an additional 7 percent exhibited a large number of signs that are part of a PTSD diagnosis. Researchers said they believe that points to a need for more mental health services and screenings in poor neighborhoods. This isn’t news, but more data is important as advocates work for better trauma-informed practices among government agents. Of course, when Chicago got a million dollars recently to address trauma in the neighborhoods, they spent almost all of it on new cops. When involved in Taser incidents, including instances when a Taser is drawn but a shock is not delivered, people of color were more likely to be shocked and less likely to be given a warning before being shocked than whites. The state of CT found that 100% of these taser uses were justified, and that’s where the problem lies. Such weapons are an important tool for law enforcement, but too often they are used not in lieu of lethal force (it’s better to tase than shoot! ), but in lieu of patience and conversation. The people who suffer from this the most are people of color, disabled individuals, and especially disabled people of color. Accountability must be part of reform. Data serves accountability, so I’m glad they are counting. Yesterday I wrote on the Endrew F. v Douglas County decision from the Supreme Court. It’s powerful and could make a real difference in special education in this country. In the meantime, though, even as the decision was being handed down, ADAPT (a direct action disability rights group) was occupying the Capitol Rotunda, chanting, and eventually being arrested. I wrote a piece about SCOTUS, Gorsuch, and ADAPT, while remembering all the ways that disability rights can and should be bipartisan. For decades, Democrats and Republicans have come together to pass legislation and support regulations to make America more inclusive for people with disabilities. Not only did a Republican president (George H.W. Bush) sign the ADA in 1990 after it passed with overwhelming majorities, but the same congress and president easily reauthorized the Education for the Handicapped Act and renamed it IDEA. A Republican congress reauthorized the same bill under President Bill Clinton, in 1997. In 2008, President George W. Bush signed the ADA Amendments Act, passed by a Democratic congress, which explicitly expanded ADA protections to people with mental disabilities. President Barack Obama signed a law permitting some disabled people to work and save money without jeopardizing access to benefits, and another encouraging integrated work opportunities for disabled people. These were both passed by huge margins in the otherwise highly partisan 113th and 114th congresses. Julia Bascom, executive director of the Autistic Self Advocacy Network, reads these words from a sheet of paper that she holds in steady hands. Her voice is quiet, but it carries through the meeting room of the National Transitions Youth Center, a small office building near Foggy Bottom in Washington, D.C. Bascom seems tall in her black dress, almost ministerial, as she leads a small congregation of mourners in a ritual of shared grief. It’s March 1st, 2017, the Disability Day of Mourning, and we’re about to recite the names of the dead. I wrote for Pacific Standard on murder of disabled people and the way the victims are erased from their own stories, based on my visit to DC and the Disability Day of Mourning this year, plus the Ruderman Foundation white paper on filicide. Sesame Street moved Julia, a muppet whose character is autistic, from online only to the TV screen, and the story consumed a lot of my Twitter space. People are all happy she exists. People were happy when they announced her. I’ve seen lots of optimism, including from many, many, autistic people. But that doesn’t mean there aren’t issues. One of my opening thoughts was that everything was focused on neurotypical kids learning about autism, rather than using Julia to help provide role models for autistic kids. Sesame Street has, of course, always been about diversity, and has always (well for a long time) included disability in their diversity. Here’s two things to read from writers who ID as autistic/neurodiverse AND as parents. So, it’s good to see Julia on air, but plenty of ways in which Sesame Street promotes ableist narratives rather than resists them. Adam Cohen is the author of Imbeciles, an recent, widely read, book on the history of eugenics in early 20th century America. It’s a solid book that about a history that isn’t well known, and I’m glad he wrote it (though I am not sanguine about the movie deal based on it, but that’s not his fault and is a separate story). As a practical matter, though, the genie is already out of the bottle, and it is unlikely we could stop embryo editing if we wanted to. New advances are coming rapidly, and gene editing is only becoming easier, faster and cheaper. Again, that need not be a bad thing. Twentieth century eugenics has rightly been called a “war on the weak” — its goal was to stop people with conditions like Huntington’s disease from reproducing. Twenty-first century eugenics can enable people with the Huntington’s gene to have children without it. The new eugenics can be a war for the weak. The whole thing reads to me like a pitch to sell more copies of his book, now out in paperback. I get it. I, too, am finishing a book and hope to sell many copies. But I think he’s taken precisely the wrong lesson from the history – an ableist regime, whether based on forced sterilization or gene editing, will always reflect the oppressive biases of the society that constructs it. America – like most of the world – kills, incarcerates, and abuses its disabled citizens, especially those who are multiply marginalized by race, class, gender, sexuality, religion, or other categories of difference. Any eugenic gene editing process that is constructed in our culture will reflect the ableist reality in which they are created. In the future, disability will code for poverty, for non-white, for non-Western, and the oppressions will intensify. I am not an optimist, even as I rally to fight against this future.